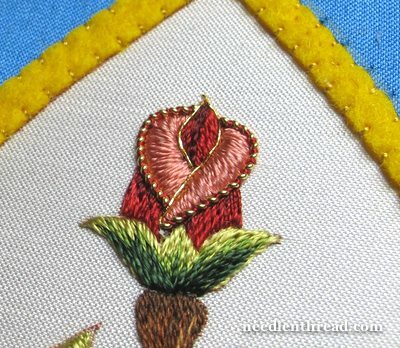 With the goldwork finished on the lower half of the Mission Rose, the next step was the top part, where the bud resides. The goldwork techniques here are the same techniques used in the large rose, but I had a little mishap (or rather, I made the wrong decision) with one of the threads. The outer part of the pink on the rose is outlined in the stretched pearl purl twisted with red silk, just like the same part on the large rose. I wanted to couch a fine gold thread inside the pink petals and around the inner bud area, so I used a tiny #7 tambour thread, which is quite fine and flexible. I was thinking it would be perfect. In fact, I cringed. It just didn’t look right at all and it didn’t blend with the rest of the project. So…. out came the tambour thread! I resorted to the same check thread that I used on the stems, the large leaves, and the rose, and I liked it much better. So that’s the bud, finished, and now it’s just a matter of finishing half of that stem below the bud, and outlining the little leaves. Those little leaves are going to get a different thread altogether. Because they’re a lighter green, and a little more delicate than anything else on the project – they kind of have a wispy look – I want to use a lighter gold thread on them. We’ll see that next time and we’ll take a look at the whole center of the design with the goldwork finished. Then we’ll tackle the blue silk area and then the frame! The frame is going to take a while, methinks….. If you’d like to follow this project from its beginning, you’ll find all the articles relating to it listed in chronological order under the Mission Rose Project Index. You’ll also find the design, information on the thread choices, ground fabric, and so forth. 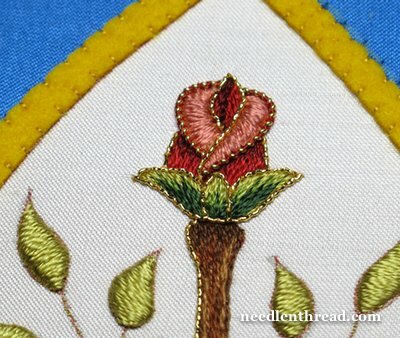 The bud looks lovely with the goldwork added and I agree it looks better with the check thread. I can’t wait to see what you do with the blue silk and the frame, the project is really coming together now and is looking really lovely and professional. Thank you for sharing the details of your projects and especially the thought process. I have learned so much from your work! It’s beautiful. This is like when we were kids and going to the movies every Saturday afternoon: for me the highlight was the ‘serial’. I would wait in great anticipation all day for the 10 or 15 minute episode that may or may not have resolved last week’s dilemma. Watching the progress of your gorgeous works is a bit like that anticipation: waiting to see what beauty you produce next. And then the let down when the end comes; but not for long, because there is always a new project. Previous Previous post: Thread Talk: Overdyed Threads – Your Take?